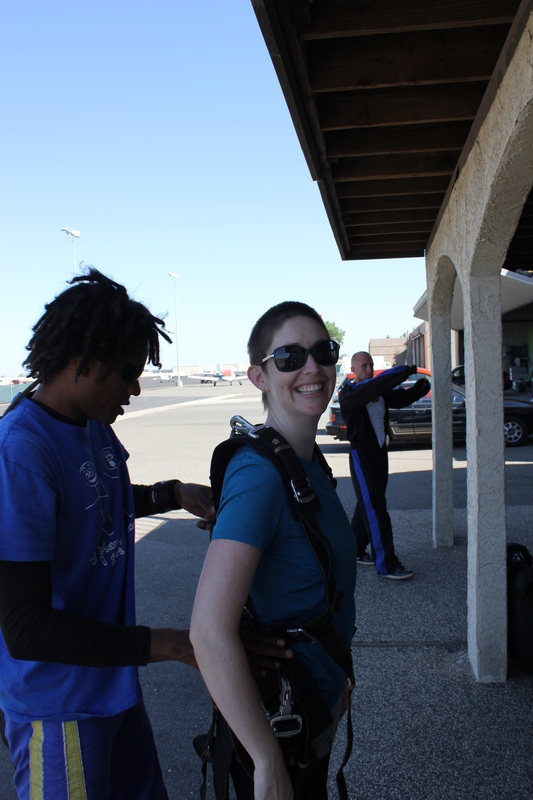 California – Erin jumps out of a plane! I always thought this was going to be something that I would talk about doing but never actually get around to doing. Happily, I met Ashley B., partner to one of Matt’s co-workers, and she is a doer. Ashley found a deal online for Skydive Sacramento and instead of just talking we bought our tickets and I made a reservation. We were committed now and couldn’t back out! We convinced the boys that they wanted to see us jump out of a plane so we all piled into the car on a Saturday morning, before the sun was up, and took off for a tiny airport outside of Sacramento. Nervous? Hell yes! We chatted excitedly to keep ourselves distracted and grilled folks who jumped before us. Our jump-guides (the people we would be strapped to) introduced themselves and helped us into our harnesses. I was feeling pretty good at this point – excited and nervous but still wanting to do it. We boarded the tiny plane, which wasn’t out of my comfort zone as I have been in and flown smaller planes. I was fine as we circled higher and higher, even when they had the door open for the first few minutes (it was 100+ degrees! ), and only a little queasy when they said we had reached our jump height and they re-opened the door. My jump-guide, Marc, had kept me entertained with stories of his history jumping with noobs and bits of advice. I remember him saying that it was ok to scream because if I was screaming than I was breathing. It turned out that we were going to be the first team to jump after a few guys jumped solo. My feet started to itch when the first guy jumped – itchy feet is my body’s signal that it is upset about the height – and my stomach was definitely flopping around when the second guy jumped. This was it. It was our turn. Holy crap! How did I get in this plane? Why was a strapped to this stranger? He’s going to fling us out of the plane – WHAT?!? 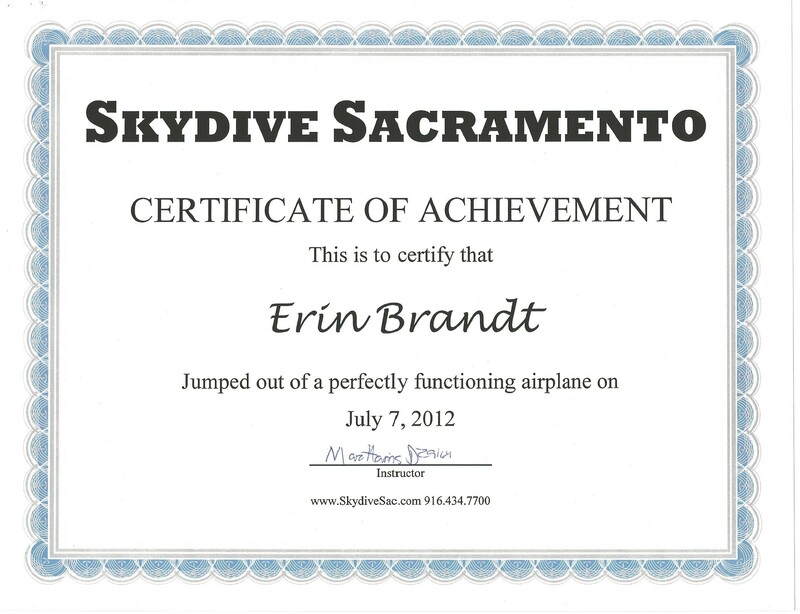 I screamed the f* bomb over and over and over during the free fall, which lasted no more than a few seconds. By the time my brain caught up with the fact that my body was falling and it was actually totally AWESOME, Marc had pulled the chute. And then it was the most beautiful, peaceful, breathtaking, and exhilarating minutes of my life. After the noise of the plane, the rushing of air, and my screaming it was so very quiet. I was as close to flying as humans get (excepting: base jumping, paragliding, etc.) and I never wanted it to end. Sadly, gravity called us home and we landed too soon. I will boast that we had an awesome landing that included me not knocking us on our asses. Once free of my tether to Marc, all I could do was jump up and down, yelling about out f*ing amazing it was. Ashley touched down right after me and we made our way over to the boys. 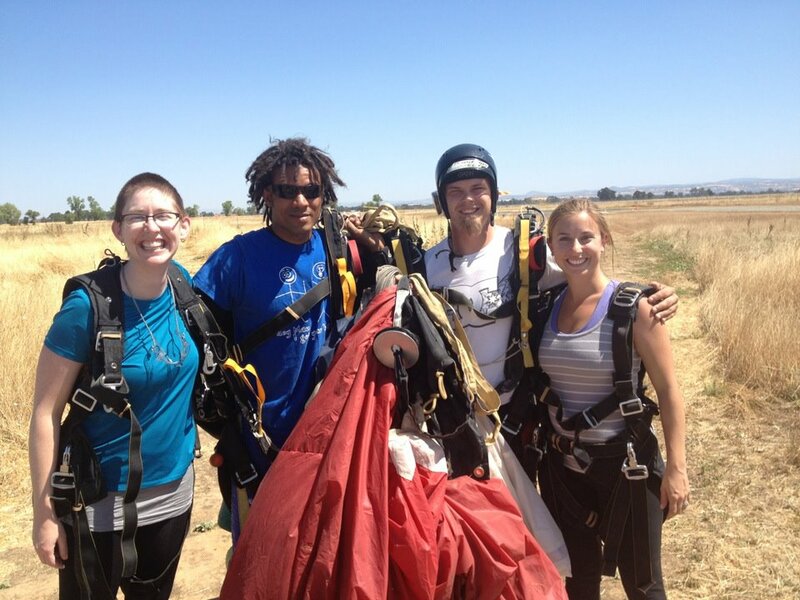 Ashley and I were high on adrenaline for hours, talking non-stop about the awesome-sauce that is skydiving. Until we nodded off in the car on the way home; thankfully, Matt was driving. Will I do it again? Hell yes! I really want to go with Matt next time and anyone else I can drag with us. 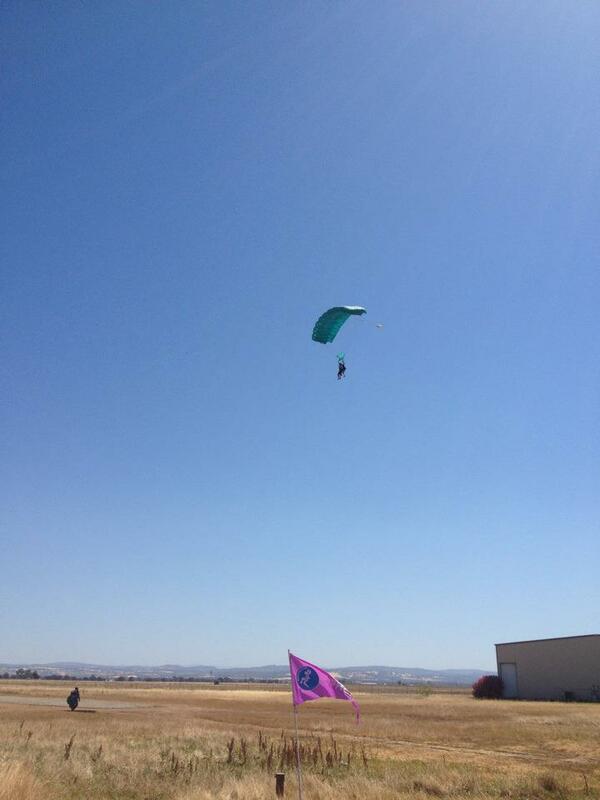 I will never cross skydiving off my bucket list because I can’t imagine the thrill every fading.